About five inches long. 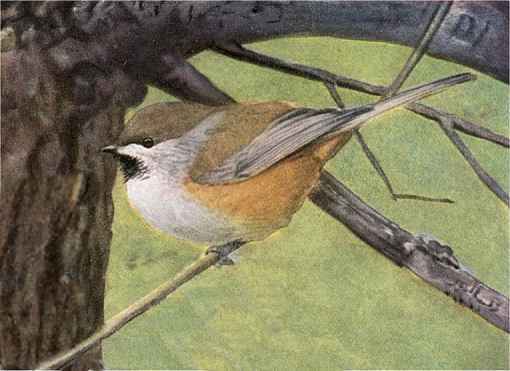 Similar to, but darker than the Black-capped Chickadee. Grayish brown crown and back. Black throat. Ashen-white undersides and sides of neck. Chestnut flanks. Gray wings and tail. Inhabits coniferous forests in Alaska and across Canada from British Columbia to the northern Great Lakes Region, Ontario, Quebec, New Brunswick, Nova Scotia and down to the New England States. Forages for insects, seeds and fruit occasionally in flocks with black-capped chickadees. Stores seeds and insects for the harsh northern winters. Feed chickadees sunflower seeds, nyjer (thistle seeds), nuts and suet. 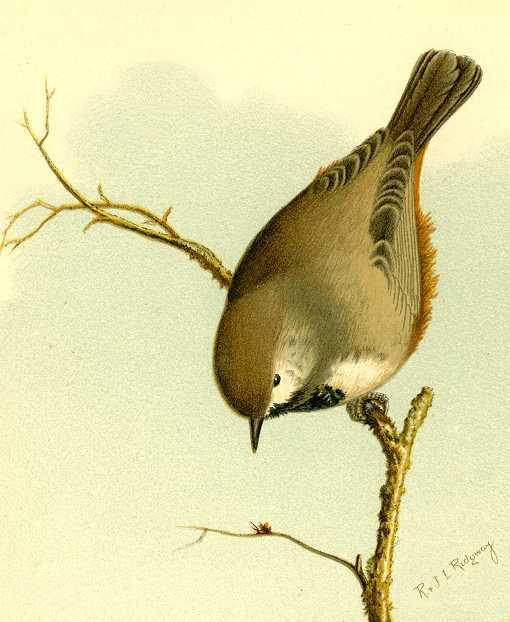 Sings similar but more deliberate and lower pitched notes than the black-capped chickadee. The birdhouse for boreal chickadees (same as for nuthatches, titmice, downy woodpeckers and other chickadees) has a 4″ by 4″ floor, 9″ inside ceiling, 1 1/4″ diameter entrance hole located 7″ above the floor and ventilation openings. More about this birdhouse. Mount nest box on a tree trunk or hang from a limb from chest level to just out of reach, higher only if necessary. Place a few chips, not sawdust, on the nest box floor. Remove the nest from the box after the brood rearing seasons are over. About five inches long. Similar to, but darker than the Black-capped Chickadee. Grayish brown crown and back. Black throat. Ashen-white undersides and sides of neck. Chestnut flanks. Gray wings and tail. Builds nests of moss, fine grass and rabbit fur in cavities low to the ground in decayed stumps and higher in trees. Forages for insects, seeds and fruit occasionally in flocks with Black-capped Chickadees and stores food for the harsh northern winters. Mount nest box on a tree trunk or hang from a limb from chest level to just out of reach, higher only if necessary. Place a few chips, not sawdust, on the nest box floor. Remove the nest after the brood rearing seasons are over.